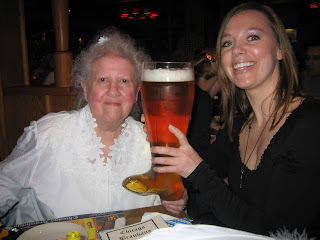 Fat and Happy Blog: An 81 year old and a beer filled boot! Den ise is my adopted Grandma. Some people adopt kids, I adopted a Grandma. It's been over 10 years since I've met Denise. She's a card; completely happy-go-lucky- but also completely ready to 'go' ...because then she gets to be with her guy. Denise came to visit (from Denver) for her 81st birthday. She loves to try new things, see loves to travel to new places and most important - she loves to eat ethnic food. Which works well for me. 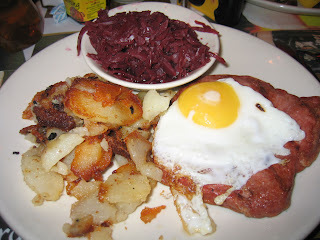 She is Serbian and loves German food, so one of the first places we took her to was the Brau Haus in Lincoln Square. And the first thing we ordered was a boot of beer! She loved it as you can see from the photos below!!! 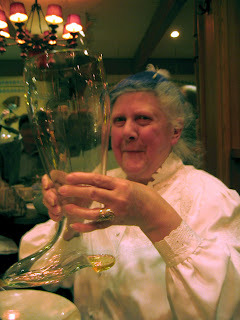 In the beginning I had to help her lift the boot in order to drink out of it because it was so heavy. 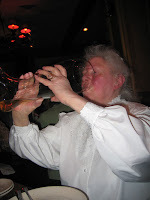 The funny part is a photographer from the Chicago Tribune happened to be there taking photos for an article that night, and took photos of Denise drinking out of the boot for the paper. I can't wait to see that paper! Denise ordered the wiener schnitzel which was such a huge portion that she took half of it home. I ordered the grilled meatloaf with a fried egg on top. Now I must say, when I read 'grilled meatloaf' on the menu, I envisioned the classic meatloaf- you know, ground meat in the form of a loaf. What came was a big piece of ham, maybe spam, I'm not even sure. The cabbage and potatoes and fried egg were fabulous. The 'meatloaf', not so great. But I tried it and now I know what German meatloaf is. We also took Grandma Denise to a Greek restaurant (Santorini's) where I had a fabulous whole grilled sea bass. Santorini's had a great warm feel like an old Greek farmhouse, complete with a big open fireplace. Cafe Iberico for Spanish tapas was a fun place and an interesting menu. It's a large interesting feel with a great old deli case, two separate long bars with Spanish dishes, pans and wares for sale. I did also take Grandma Denise to the Russian tea house for lunch. The Borscht was outstanding as usual and I opted for the classic cabbage roll which was also outstanding. It is an expensive place, but how often do yo u turn 81? She's worth it.